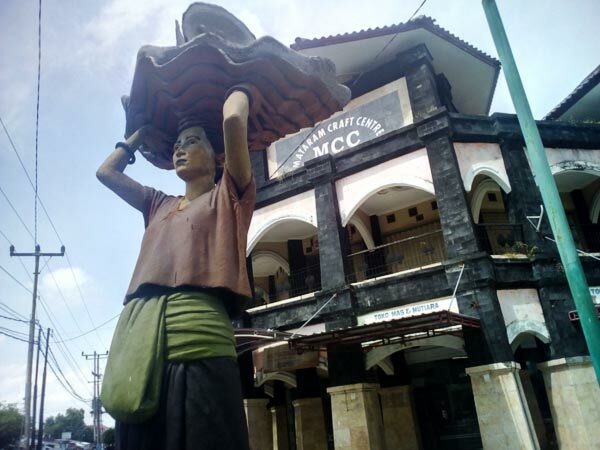 Mataram, the capital and the biggest city in Lombok, has evolved over the years. Back in the day, it used to be smaller and didn’t look nearly as impressive as it does today. Right now, it is home to several ethnic groups, including the Sasak people, the Hindus, and the much smaller groups of Arabic and Chinese people (yep, you heard it right). Every single part of the city is unique and feels different from the others. For example, Ampenan used to belong to the Dutch invaders and still has buildings and streets that remind the locals of the tough times their ancestors had to go through. It’s the most colorful part of Mataram and is a mighty tourist magnet (check out my review). As for the Sekarbela village, it’s located just four kilometers away from the city. Some people call it a separate settlement, while others claim that it’s a part of Mataram. Well, that doesn’t really matter to us, the tourists that want to have a good time, so let’s not focus on that. Take a look at the map: it’s right in the center of the “action” and is surrounded by temples, restaurants, hotels, and everything else in between. And in that regard, it doesn’t really look or act as the rest of the villages in Lombok. On the downside, public transports never head in that direction. Still, what’s so special about it? Why did I decide to write a review? It’s time to find out! The locals are calling it the “den of pearls”, and you’ll see why once you enter the area. The village is covered in all kinds of jewelry stores that will steal your breath away. It’s safe to say that if you want to buy some high-quality souvenirs for your loved ones, this is the place to find them. True, the pottery/weaving products are also quite impressive, but nothing compares to pearls, right? In Lombok, this business is becoming bigger and better, and the owners of jewelry stores are now able to invest even more money, time, and energy into their work, creating a huge line-up of amazing jewelry both for the native people and the tourists. Interesting fact: in the past, the Sekarbela village used to be a large field where the locals cultivated rice. However, these days, it’s home to the finest craftsmen. Hand-crafted items are always more valuable because they are all unique. The line-up of the available jewelry is pretty huge. You’re free to choose between earrings, fancy bracelets, brooches, and lovely necklaces with tiny “bits” of gold and silver. Obviously, the more work they put into a certain piece of jewelry and the more expensive the materials/metals used, the more you’ll have to pay for it. The prices are more than fair, especially if you’re from America or the leading European countries. It would be great if you knew a little bit about jewelry; that way, it would be easier to pick just the right one at a low price. At the same time, I have absolutely no knowledge of this business and still managed to buy several beautiful pieces for my friends. The pearls are found in the South Sea, AKA the “Sea Of Pearls”, and many pros have stated that they are of the highest quality. You can pay for the jewelry using credit cards and even foreign currencies. That’s true for almost every single shop in the Sekarbela village. That wasn’t the case a couple of years ago, but now the merchants finally realized that for business to prosper, they need to make the process of buying as easy as possible. I’m happy to say that the items made by the citizens of this village have international value and are quite competitive in the worldwide markets. Remember I mentioned the Arabs that still live in Mataram? According to ancient legends, the very first people of this ethnic group that arrived in Lombok were merchants. They taught the locals the art of trading but kept the most important secrets to themselves. Therefore, most of the owners of jewelry stores in the Sekarbela village are the descendants of those brave folks that stepped foot on this island all those years ago. Will they try to rob you of your bucks? Of course, they will – but only if you let them! Hands down, the competitive prices are the biggest selling point of the local product. Note: you’ll see plenty of pearl stores on the main road. However, according to some of my friends that live in Mataram, they’re not the best ones. Follow the narrow roads – that’s where you’ll find the finest offers. They also told me that in the past, the village used to focus solely on silver/gold jewelry. But when the villagers learned how to cultivate pearls, they became the new pride and joy and the main component in their jewelry. As mentioned earlier, the pearls from the South Sea are among the rarest and most expensive ones on planet Earth. They are pretty big and are valued across the globe. Fun fact: the merchants at the Sekarbela village claim that the Russians are the biggest fans of pearls in Lombok. The local shop owners are always happy to see them, as they spend more money than others and almost always come back. Another fact: while the tourists love to purchase “separate” pearls as opposed to the ones turned into jewelry pieces, the locals prefer earrings and necklaces. The freshwater pearls from China are also quite popular. What’s the difference, you might ask? The sea pearls are much brighter and bigger than the freshwater pearls – that’s pretty much it. The tiny water pearls can be yours for approximately 80K IDR (~6 bucks), while the saltwater pearls and much more expensive – 500K IDR (~37 bucks). The size, the shape, the brightness, the shade, and the quality of the surface are the main aspects that impact the final price. You might not know this, but pearls are actually made by oysters, and since the temperature of the local sea is perfect for them, these pearls meet the international standards. If you want, you can visit the local farms where trained specialists cultivate them. I was on that trip and can say with certainty that it is worth the while. I learned so much about this process! They breed the oysters in their labs and multiply the tiny brutes into huge numbers (up to a million). The entire process usually takes 6 or more years. Yet, as you can see, business is booming, and the farms are investing more money into their enterprise. Summing up, I want to say that the Sekarbela village is definitely worth a visit. First of all, you’ll get to buy something special for your relatives/loved ones/friends at a low price. Second, the atmosphere at the village is amazing – it’s like you end up in an ancient Middle-Eastern market. And finally, there’s so much more to see and learn about “pearl-making” that I didn’t mention in this review. Now that you know what this place is all about, let’s see how we can get there. If you’re already in Mataram, the road will take you no more than 30 minutes in a rented car. As mentioned above, there are no public transports that go from the city to the village. So, a personal vehicle/bike is the best choice. Ever heard about cidomos? Basically, they are tiny carriages drawn by horses, and they will take you to the “jewelry capital”. Sit back and relax in the back seat while the horse carries you around. The ride from the Lombok Airport will take 45 minutes/1 hour 15 minutes, depending on the route you pick. A taxi driver will know the best route, no doubt about that. Thus, it might be wise to pay a personal driver to take you there. Depending on your luck, traffic will either be ok or horrible – you never know in Lombok. People that end up in Bali can go with a public ferry (hot, crowded, slow, but cheap) or a speedboat (fast, fun, intriguing, but expensive). My plane landed at the Lombok Airport and I hired a taxi driver. The pearls and the jewelry pieces are great, no argument there. I didn't find exactly what I was looking for, but the line-up was extensive. I've been to many places but have never seen such low prices on high-quality jewelry pieces. Definitely my new favorite spot! Wow, thanks for the insights! I never had a clue they do all that to cultivate the pearls. Now I do! This is a great review, makes you feel like you're standing in the middle of the market checking out beautiful jewelry. It's places like this one that turn Lombok into a special island. The merchants are all nice and friendly, but a little bit of bargaining won't hurt.